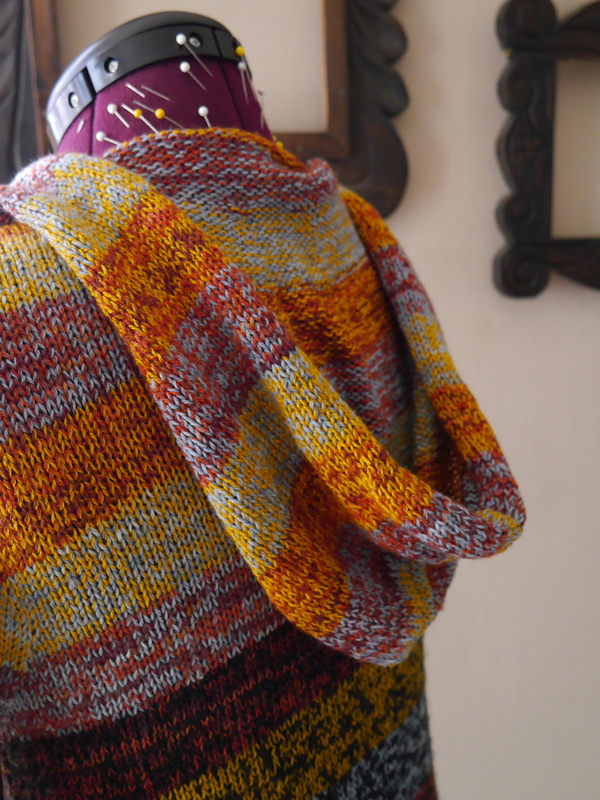 The pattern for Versio has a wide deep square collar, but instead of working the collar I followed Rililie’s notes on Ravelry about how to create a hood. 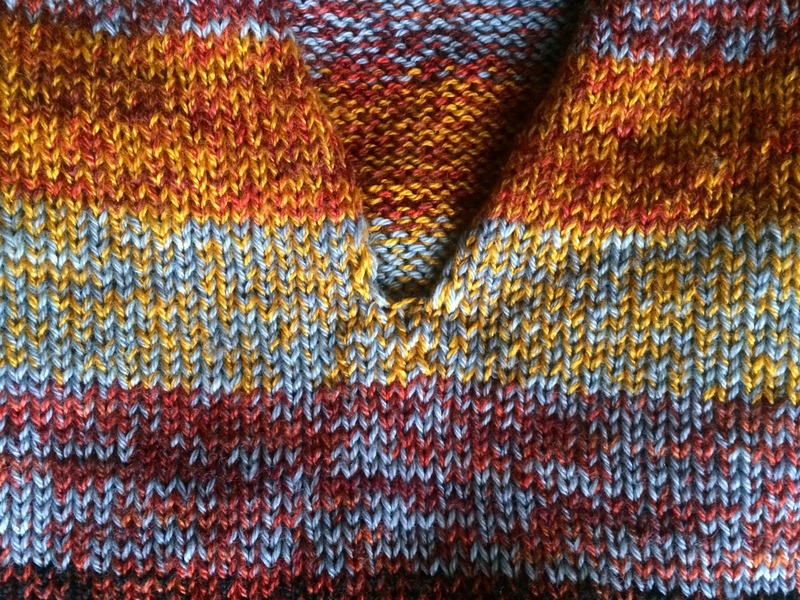 I was pleased enough with the way it came out to use it as a starting point for the hood I worked on my (Hopefully) Perfect Transitional Weather Sweater. After the knitting was all done and the (mountain of) ends were woven in, I went back and duplicate stitched around the bottom of the V neck to tighten the loose stitches, and fix some wobbly ones. It’s a little bulky in real life, but not too bad, and I don’t think it’ll be noticeable while I’m wearing it. The bottom hem, and the hems at the wrists, are worked flat and turned under to create a tube that you’re supposed to thread cording through. Since I used so many colors on my sweater, and the hems are worked in the yellow and black, I played around with a couple different color combinations. I tried four combinations: yellow & black; all of the colors together (yellow & red & blue & black); yellow & red & blue; yellow & blue. I ended up going with the yellow and blue. The yellow and black cording got lost, and the other combinations looked pretty harsh, against the yellow and black of the hem. 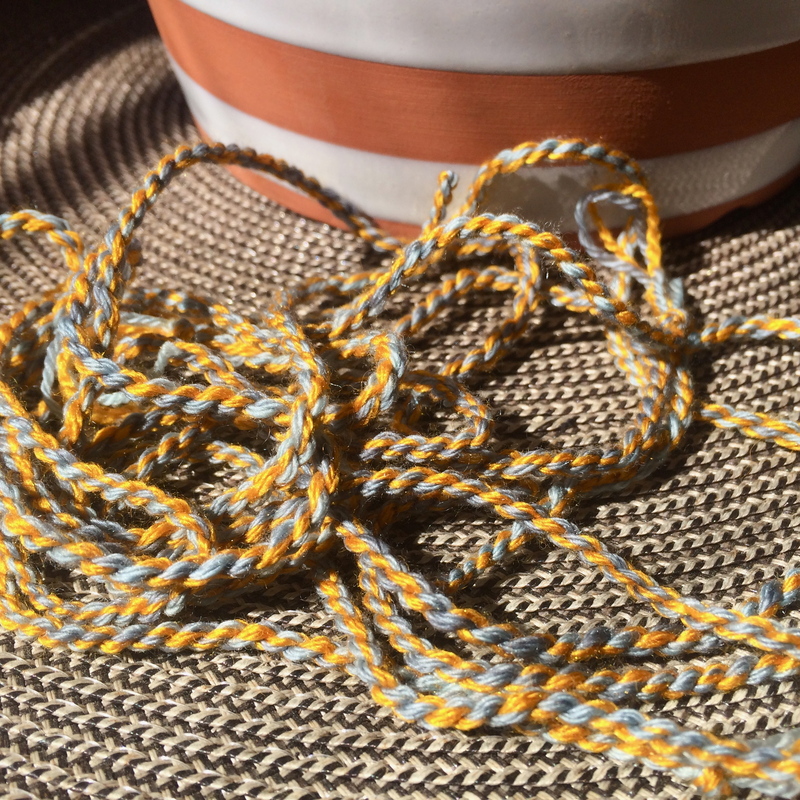 Making twisted cord is a lot of fun, and a little bit addicting. You basically hold your strands of yarn together, insert a bunch of twist, fold the length in half, and let it twist back up on itself. 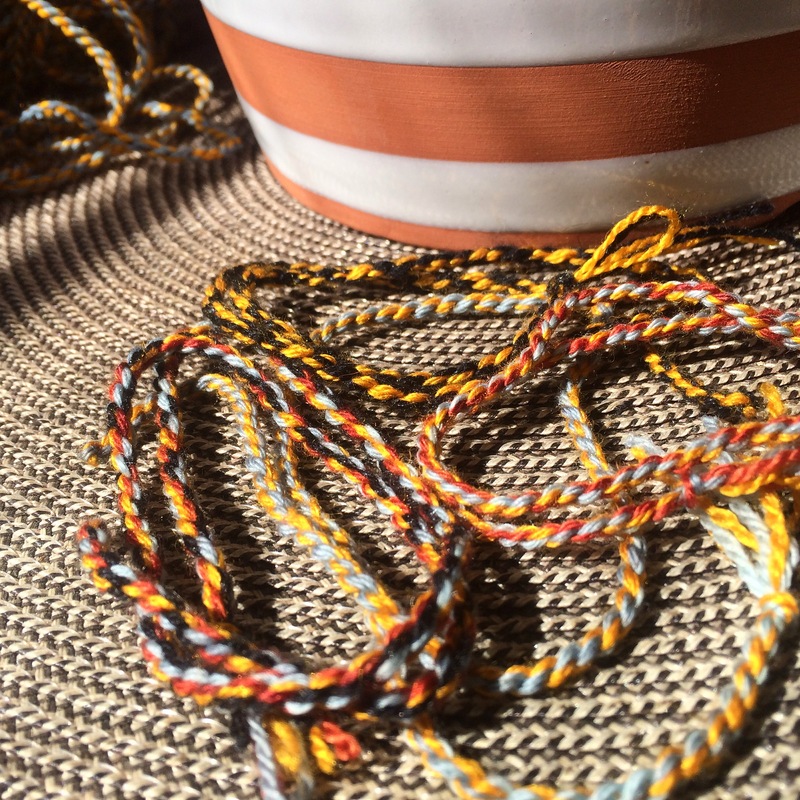 Indstructables, Stitch Diva Studios, and About.com-Knitting, all have good tutorials on how to make twisted cords. The tutorials above suggest adding the twist by hand, or using a kitchen mixer, or a power drill – but I just used my spindle. This morning’s very rainy weather, has me super excited to be so close to done with this sweater. A sweater that took 3 years to knit. And some thoughts on making teeny tiny steps forward.